Plans to detain terror suspects under house arrest without trial are vital because of the continuing threat to UK interests, the home secretary has said. Charles Clarke wants house arrest and other powers to replace indefinite jail for foreign terror suspects - something the law lords have ruled against. But the Tories, Lib Dems and some Labour MPs say ministers would get too much power to curb people's liberty. The plan means the 11 current terror detainees will be freed next month. 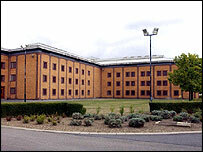 Most of them are currently being held at Belmarsh prison in south east London. The existing detention powers lapse on 14 March and Mr Clarke says the security services believe house arrest is not yet needed. Instead, "control orders" will initially include curfews, tagging or restrictions on using telephones. 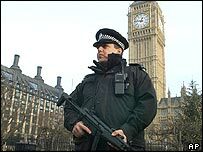 The new powers would apply to British as well as foreign terror suspects for the first time. It would be the home secretary, not judges, who decided to impose control orders. Critics say the plans could still mean "internment" at home or in government accommodation for the worst cases at the home secretary's say-so. The Tories and Liberal Democrats are taking the rare step of jointly tabling a Commons motion opposing the powers, to be debated when the plans go to a vote of MPs on Wednesday. Conservative shadow home secretary David Davis said he did not under-estimate the security problem. But he told Mr Clarke: "I believe you have settled on the wrong answer. "You are planning to sacrifice essential, long-standing principles of British liberty and justice in a way which may act to reduce that security." Liberal Democrat home affairs spokesman Mark Oaten said ministers had "moved some way" by allowing judges to review any orders quickly - but it was not enough. Mr Oaten said: "We believe it should be the judge that takes decisions, not politicians." He also urged ministers to look again at allowing phone-tap evidence in courts. The home secretary accused Tory leader Michael Howard of turning the debate into a party political issue. It was "misleading" to suggest intercept evidence could solve the problem when it could rarely clinch prosecutions, he claimed. Mr Clarke said the courts would be able to vet any use of the new powers - within a week for house arrests. He stressed he was not currently seeking the opt-out from European human rights laws needed to impose house arrest. But nobody should doubt that terrorists at home and abroad wanted to attack the UK and its interests, he argued. "Some believe that the absence in this country of a terrorist outrage like 9/11 or Madrid means that the terrorist threat has somehow passed us by or failed to materialise," he said. "That view is short-sighted, complacent, ignorant of the facts and potentially cavalier of the safety of this country." Mr Clarke said he ultimately wanted to create new terrorist offences so more cases were brought to trial. He later published "briefing papers" about the international terrorist threat and the government's response. The government says the existing powers must be replaced urgently. But opposition parties are angry MPs will only get two days - Wednesday and next Monday - to debate the Prevention of Terrorism Bill.